Raynaud’s phenomenon is a disorder of blood circulation in the fingers and toes (and less commonly of the ears and nose). It affects small arterial vessels causing them to collapse due to exposure to cold, emotional stress or vasoconstrictive agent (medication or smoking). Abnormal nerve control of the blood-vessel diameter causes small capillary to collapse (A). Finger colour first turns white (B) due to lack of blood supply, then blue (C) due to lack of oxygen. Frequent attacks can lead to serious lack of tissue oxygen at fingertips and thrombosis that can result in tissue death – gangrene (see picture below). Raynaud’s phenomenon (RF) can be seen also with: rheumatoid arthritis, scleroderma, lupus erythematosus, frostbite, hormone imbalance and cancer. A 69 years old female with 60 years of Raynaud’s syndrome and scleroderma. She had 3 open ulcers on the fingers of the left hand and gangrene on the index finger. She had cramps, weakness, partial numbness and strong pain in both hands especially during night which was managed with medications, however side effects included constipation/diarrhea and stomach problems. She also suffered from pulmonary hypertension. 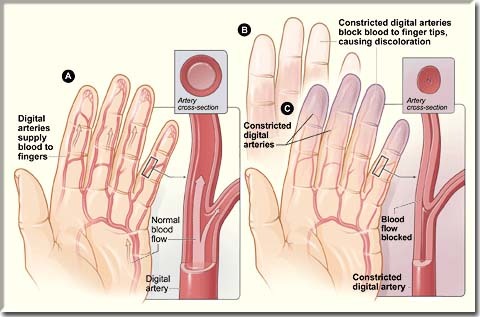 Microvascular assessment showed moderate to severe ischemia and hypoxia (reduced circulation and tissue oxygen levels respectively) in the left hand and mild decrease in the right hand. Reduced levels of both oxygenation and blood circulation were noted also in both feet, as well as partial loss of sensitivity (neuropathy in booth feet). Following microvascular assessment of both hands and legs, she initiated 40 consecutive hyperbaric sessions in oxygen compressed monoplace chamber. Treatment session was 90 min long at pressure 2.0 – 2.4 ATA (depending on the lung auscultation). Progress of healing was monitored with microvascular assessment. After 40 sessions two ulcers closed and the gangrene turned into an ulcer with clear demarcation of the improved circulation and visible granulation. Pain medication was discontinued, swelling and cramping was reduced and she had better function of both hands as well as improved sensitivity in both hands and feet. Lung function also improved and she had more energy for daily activities, better sleep and better tolerance of cold temperature and Raynaud’s attacks. With overall improved cardiopulmonary status and circulation her surgeon decided to perform a saphenous vein graft from her left leg to her left wrist where there is still some occlusion reducing proper blood flow. Following surgery she returned for additional sessions for better healing and faster recovery.